NBA Draft Debates: Marvin Bagley III, Mohamed Bamba or Jaren Jackson Jr? Assuming Deandre Ayton and Luka Doncic are off the board in the first two picks, who is the next-best prospect? The Front Office's experts answer one of the major questions the NBA draft. We’ve entered the closing stretch of the pre-draft process. Now that the selection order has been decided, teams will spend the next month finalizing their boards and gauging which players could be available when they’re on the clock. Front office judgments are not set in stone. General managers could become more enamored with or sour on certain players between now and the night of June 21. Over the next month, The Crossover’s Front Office will be using hypothetical draft-night scenarios to spotlight similar prospects: If given the opportunity, which would you pick for your team? The Crossover’s Front Office writers will choose sides and make their cases for each player. The first installment features Duke’s Marvin Bagley III, Texas’s Mohamed Bamba and Michigan State’s Jaren Jackson Jr., the three big men projected to be selected after Arizona’s DeAndre Ayton in our latest mock draft. Is it possible we’re just overthinking this? Bagley opened the season in the mix for the No. 1 pick for good reason, and reinforced his strengths with a statistically massive season. He scored in double figures every single game in which he wasn’t injured, posted 22 double-doubles, shot 64.7% on two-pointers and helped lift Duke to the Elite Eight. He did all this after reclassifying out of high school, requiring zero adjustment time to the college level. That coupled with his plus functional athleticism as a floor-runner, rebounder and face-up scorer on the inside is all promising. Bagley is also as good on the offensive glass as anyone you’ll find (4.3 offensive rebounds per-36 minutes), thanks to his explosive second and third jumps, as scouts put it. He can play off of one or two feet and is willing to outwork opponents, succeeding playing up front and moving more like a wing than a big. All things considered, he’s put together a strong body of work. If you believe Bagley is the best of these three prospects, the case has to center on his offense (there is no strong argument that he’s an especially good defender at present). Inarguably he is the most accomplished scorer of the three, and most people will tell you he’s the most ready to play in the NBA this second. Right now his game is rather low-maintenance: he makes opponents account for him on the glass, he converts easy baskets around the rim and elevates for lobs and finds pockets in the defense to convert. It’s worth noting that Bagley is a remarkably left-handed player—he almost always goes back to it and doesn’t even like to throw passes or dunk with his right. That has to improve, but he succeeded in spite of it. The game has always come easily to him, and he has a strong baseline with his offensive talent and scoring instincts that translates into a floor that doesn’t hinge on heavy usage. When discussing Bagley’s ceiling, the hope is that promise will extend beyond 15 feet with added development. He has some ability to handle the ball, shot 39.7% from three this season (albeit on just 58 attempts) and has the benefit of an athletic mismatch against slower-footed bigs. Bagley is strong and quick enough to take advantage if opponents throw a smaller wing onto him. If those components come together, he might become more of a functional four-man, running the baseline, stepping out to the corners to provide spacing and attacking from the elbows. He’s not a finished product and may never be much of a playmaker, but what he is is very solid, and what he might become is more than that. The critical factor in Bagley’s success is how much he can improve defensively—which is open for debate. 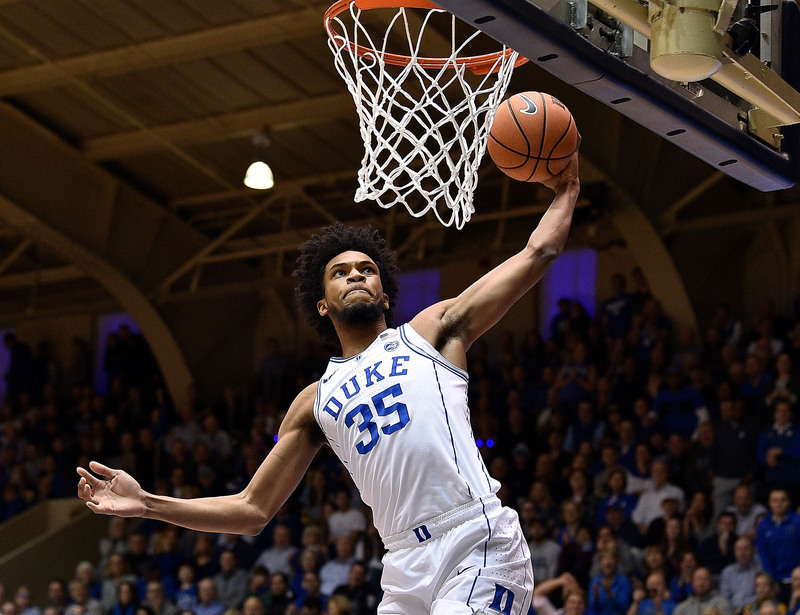 He averaged less than a block per-36, looked uncomfortable and was prone to ball-watching early in the season, and his struggles were part of the reason Duke had to shift to a 2–3 zone for the majority of the year. To some extent, you can only coach up instincts and awareness to so much of an extent. His wingspan has been measured at 7’0” and he stands about 6’11” in shoes (and opted not to measure at the combine), a number that won’t help him and will corroborate his struggles to detractors. He will never be a shot-blocking menace at the five. Bagley will either need to improve enough to defend on the perimeter, or improve his focus and positioning enough to make more of an impact defending ball screens, lest he be pick-and-rolled to death by opponents. It’s certainly difficult to become a star with a weakness that pronounced, in a league that has evolved to make hiding defensive sore spots a tall task. There are no secrets in this debate—it’s really based on what you value, and as with any draft decision, which player is drafted where will revolve around organizational fit. When we say “best prospect available,” remember that “best prospect” is a relative label. If you’re a GM in need of immediate help up front and (or) simply can’t afford the timetable that Bamba or Jackson are likely to require in order to become impactful starters, then Bagley may will be your man. As clearly as DeAndre Ayton separated himself from the mere mortals of this year’s draft class, to me, Mohamed Bamba emerged his head and broad shoulders above Jaren Jackson Jr. and Marvin Bagley III. The last decade of the NBA has morphed the league into a giant science experiment, testing which players and schemes flourish when catalyzed by the optimal coaching staff and front office. I believe the ideal modern center is capable of both draining threes and rolling hard to the rim as an acrobatic lob threat, while also boasting the feel to operate dribble-handoffs on the perimeter and find open weakside shooters mid-dive to the basket. Defensively, I want my center capable of defending pick-and-roll action in various ways: hedging onto the ball-handler, flat-out switching, and dropping back as a menacing rim protector. I think after this collegiate season, it’s pretty obvious Bamba checks all of those boxes, while Jackson and Bagley fall a bit short in a few categories. While Bamba converted just 27.5% of his threes and 68.1% of his free throws at Texas, he uses some of the most fluid shooting mechanics of any 7-footer I’ve evaluated since I began covering the draft in 2013. Conversely, I don’t believe either Jackson’s wrinkly form or Bagley’s contorted jumper will convert 39% of their threes long-term, although they’re viable skills. The veracity of Bamba’s lob threat is undeniable. Few humans want to contest this freak 10 feet in the air, above solid hardwood. His absurd 7’10” wingspan certainly helps. Bamba’s passing numbers are far from ideal—he dished just 15 (!) assists in 30 appearances for the Longhorns, but any sensible assessment of his film will yield that Bamba possesses an obvious feel for the game, able to swing the ball around the perimeter and make reads on the move. Defensively, Bamba set the single-season block record at Texas rejecting 111 in total and 3.7 per game. He’s just a menace at the rim on both sides of the ball. The true question will be his ability to compete in switch and hedge situations on the perimeter. 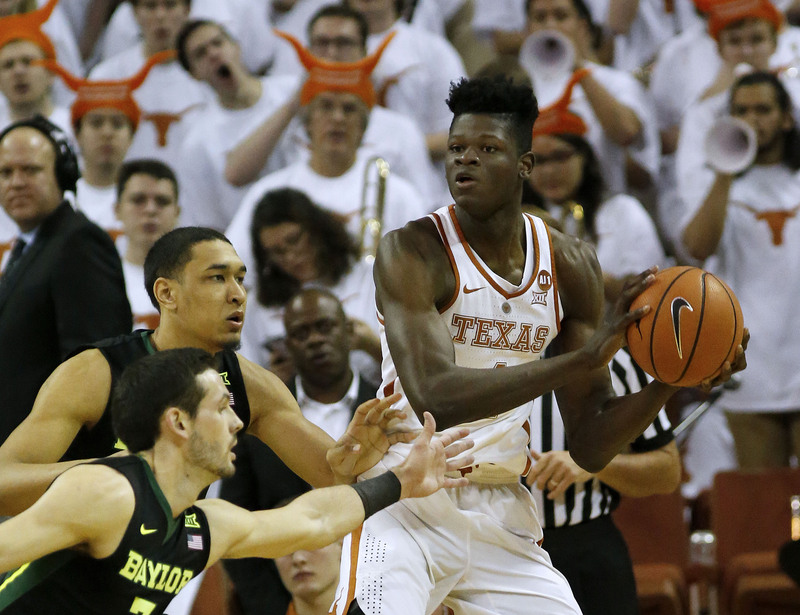 We were privy to quite a few of those looks at Texas and Bamba certainly held his own. He has the tendency to let smaller guards past him in order to swat shots from behind, which could burn him some at the next level. But overall, he’s one of the premier defensive prospects we’ve seen in quite some time. Bamba harbors perennial Defensive Player of the Year candidate potential, the kind of player you can build an entire defense around, who lets you gamble on high-upside offensive talents who struggle to guard their position. You’re going to see plenty of eight-second highlight videos on Twitter of Bamba ferociously closing out on a shooter on the perimeter, only to immediately sprint back into the paint and smite an opponent’s putback attempt. Bamba might have the lowest floor of these three prospects. How valuable is his length, timing and instincts if he fails to add bulk and gets bullied in the paint by NBA veterans half his size? If his jumper’s effectiveness never matches its appearance, will he even provide any stretch offensively? I’m clearly confident his rawness will braise into a finished product, and his strengths will translate to the next level. And to me, it’s obvious that a sweet-shooting Rudy Gobert is a tantalizing premise, one that far surpasses that of his peers. 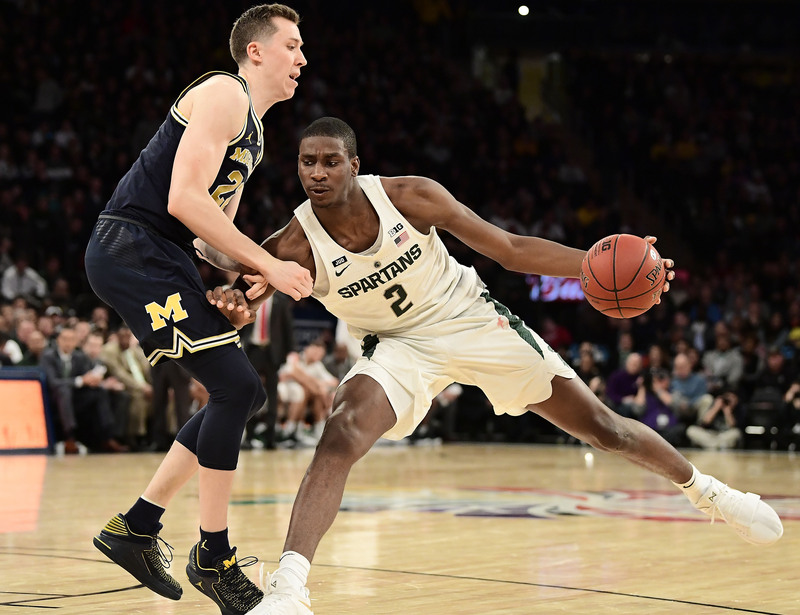 Chris Johnson: Jaren Jackson Jr.
At the beginning of last season, Jackson seemed the least likely of this trio to become a top-three pick in the draft. He was a McDonald’s All-American coming out of La Lumiere School in La Porte, Ind., but Jackson ranked ninth in the final version of the 2017 Recruiting Services Consensus Index, a composite incorporating data from several services. Bagley checked in first and Bamba was fourth. Over the course of 35 games at Michigan State, Jackson arguably eclipsed both Bagley and Bamba in this class of prospects by showing off a well-rounded game that feels tailor made for an NBA that prizes perimeter skills on offense and versatility on defense. Maybe Jackson’s most obvious asset is his rim protection. He’s an instinctual shot-blocker who's quick off his feet, positions himself well around the basket and does well to anticipate opponents’ scoring efforts. In 18 games against Big Ten competition last season, he swatted 15.5% of opponents’ two-point looks, the highest percentage in the conference, and he ranked second in the country in defensive box plus/minus. Even if Jackson isn’t sending floaters into the fifth row, pinning layups on the glass or turning back would-be dunkers, a 7’5’’ wingspan enables him to assert himself as a drive-deterring presence around the basket. Jackson’s defensive package is just as enticing away from the paint as it is inside it. Although his 6’11’’, 236-pound frame is suitable for the five, Jackson can comfortably trade defensive assignments thanks to his length and lateral quickness. His ability to corral guards on the perimeter, check forwards looking to create off the bounce and bang with brutes on the inside could make him the keystone of an elite defensive scheme. Look no further than this season’s Golden State Warriors and Houston Rockets to appreciate the outsize impact switching can have in the crucible of the conference finals. Basketball’s go-to counting statistic (10.9 points per game) undersells Jackson’s offensive potential, but he’ll be a major asset on that end of the floor because of his capacity to space the floor with his shooting. At Michigan State last season, Jackson drained 39.6% of his 96 three-point attempts and 79.7% of his 133 attempts from the free-throw line—a favorable mark for a prospect at his position and one that supports the notion that Jackson’s long-range marksmanship is for real. The funky, low release on Jackson’s jumper won’t hearten the shooting coach of the team that drafts him, but it’s worked for him so far, and it should continue to work at the next level. Jackson’s two-way skill set would be intriguing for any college player, but he brings the added benefit of being one of the youngest players available. He won’t turn 19 until the middle of September. Jackson looks like a franchise-altering prospect right now and, relatively speaking, he has a longer developmental runway than either Bamba or Bagley III, the former of whom turned 20 earlier this month and the latter of whom turned 19 in March. Assuming Ayton and Real Madrid stud Luka Doncic are off the board by the time the Atlanta Hawks make their pick at No. 3, they should think long and hard before passing on Jackson.